Rick Larkin is VP-Analytics of Engagement Labs. As a data scientist who has spent his career in market mix modeling on behalf of many of the world’s leading brands, Rick is now emerged in understand the relationship between social influence and business performance. He spends his time estimating the impact that real life and social media conversations have on brand sales, leveraging Engagement Labs’ proprietary TotalSocial® data streams. In the following Q&A, he explains how his work is essential for improving marketing strategy and ROI. Can you give us a quick overview of your role and what you do? We live in a world in which statistical models help determine how marketers spend about $200 billion in U.S. advertising expenditures every year, and over half a trillion worldwide. My job is to help our clients improve the accuracy of those models by incorporating social data into them. At Engagement Labs, we are at the forefront of understanding how consumer conversations predict business results, and working closely with clients so they can increase revenues by better managing those conversations. We leverage advanced analytics and machine learning to derive these insights. How does modeling “social influence” differ from other types of modeling? Our work in the “social” sphere is unique in two ways: 1) the data sets available to us; and 2) our deep experience in in incorporating social data into marketing models. Engagement Labs has the most extensive ongoing measures of word of mouth about brands, dating back more than a decade. Knowing how important offline conversation is to consumer and thus to brands, this offline data is a key component of our TotalSocial data and analytics platform and is a crucial part of our value to modelers. 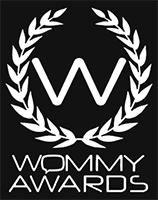 In addition, we have developed a data transformation and scoring method that applies both to our offline WOM data and to the “social listening” data we have in TotalSocial. It also comes from Twitter, blogs, forums, and other social media. These methods have allowed us to distill wide-ranging data into eight discreet metrics that are highly predictive of brand outcomes. We have a lot of experience in how these data work in models. Social data can directly drive consumer purchases, but also it can work indirectly, in combination with other marketing activities. 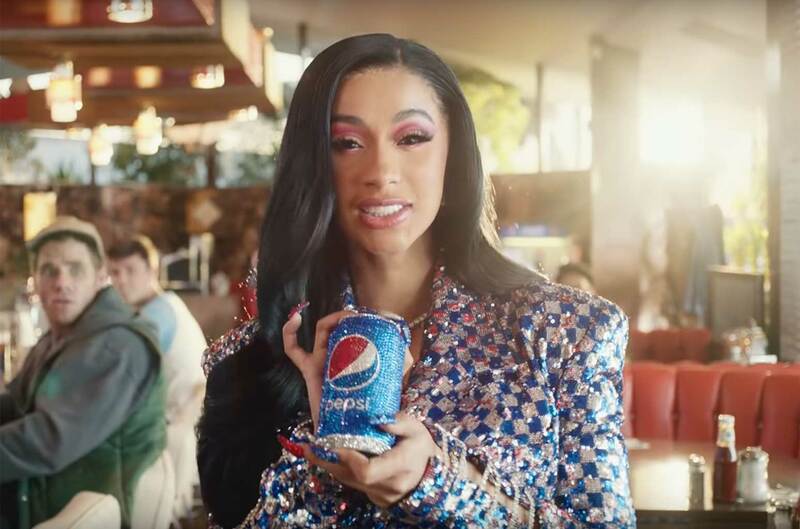 Think of it this way: A TV commercial or digital marketing can influence a consumer directly, but quite often what it in fact does is spark a conversation that persuades a consumer to make a purchase. Understanding this two-step process is vital to successfully absorbing social influence data into models. We have learned that a substantial part of the impact of paid media is a result of word of mouth. How big is the impact of social influence on consumer decision making? What’s the current state of knowledge? 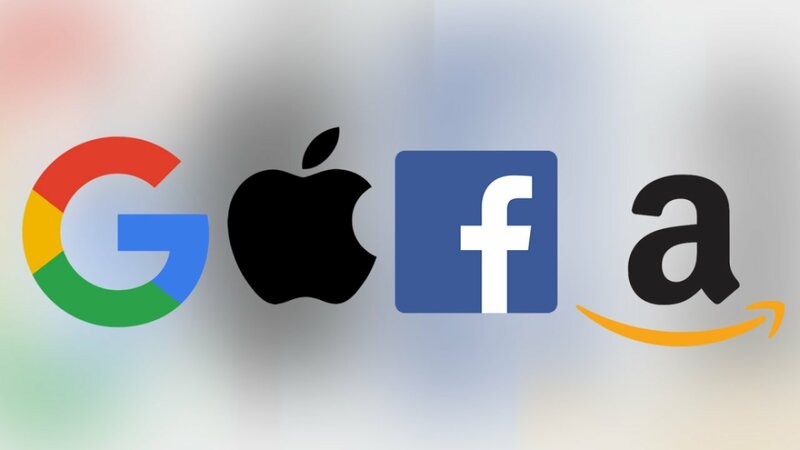 Extensive research clearly proves that both “real life” and social media conversations are critical pathways for consumers in their purchase journey. I’m just finishing up a project that takes prior analytics efforts a substantial step further. We’re modeling the sales impact of both offline and online conversations for nearly 200 brands. Our initial results show that conversations on average drive about 20% of sales. In other words, the impact of social influence, both offline and online, is very substantial and should not be overlooked by brands. While this is the average, our research shows each brand has its own “social DNA.” The way social influence works for one brand can be quite different from the way it works for another, even for brands in the same category. Some brands are driven by the volume of conversations that occur either offline or online; for other brands, sentiment is most impactful. For still others, social success is linked to whether the brand has won the attention of key influencers. At Engagement Labs, we help clients to know what is driving THEIR brand and how big the opportunity to drive incremental sales is if they maximize their performance. We’ve been able to demonstrate how tens of millions of dollars in incremental sales can be unlocked. Many brands already have a marketing mix modeling effort underway to improve marketing ROI. What does Engagement Labs bring to the table? Engagement Labs offers not only new streams of quality data, but also the know-how for incorporating that data into both new and pre-existing models. We work with the data from TotalSocial and integrate it with client-provided data that reflects their most important KPIs to reveal the metrics that drive business outcomes. Then, for clients who have their own analytics programs, we roll up our sleeves and work alongside their modeling team to help it incorporate social influence data (online and offline) to strengthen the predictive power of their models. Here are just a few of the ways we help our clients get a clearer understanding of just how much social influence impacts their marketing and sales strategies – and what they can do about it. Integrate word-of-mouth to predict sales. Social influence is a crucial component to test when constructing forecasting models. 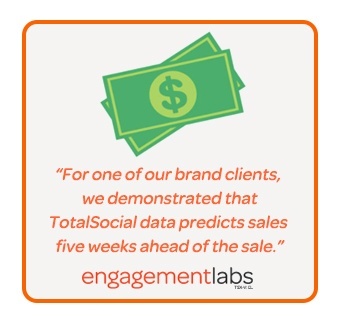 For one of our brand clients, we demonstrated that TotalSocial predicted sales five weeks ahead of the sale. Gain insight into the mechanisms driving sales improvement. Quantifying marketing’s amplification via social influence is essential for calculating marketing’s full ROI. For example, advertising makes people talk, and often we find it drives up to 30% of brand conversations. Pinpoint the consumers most likely to talk about and recommend your brand. By identifying the groups most prone to talk about and recommend a brand, we deliver valuable insights that help our clients prioritize target segments. In a recent financial industry project, we found that women had four times the social value of men and when compared to the client’s marketing focus we reveals women were an under-leveraged target. Gain new insights into competitors. TotalSocial reveals the extent to which positive or negative conversations about other brands in the marketplace impacts your brand sales. Based on our own personal experience, most of us accept that word-of-mouth is a vital factor in consumer decision making. 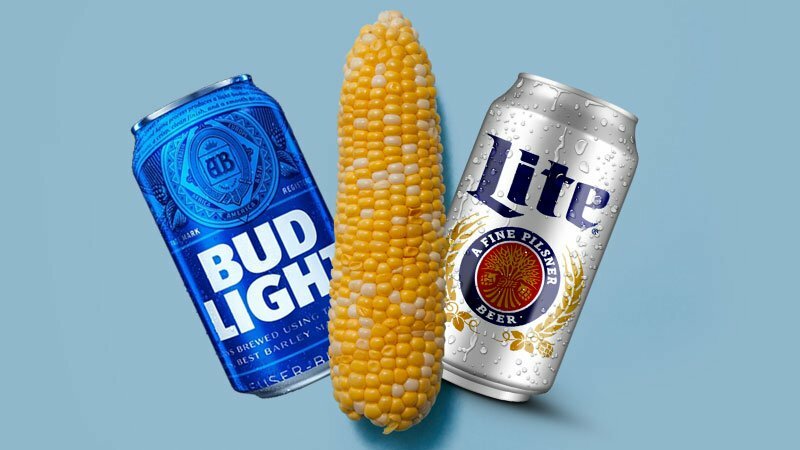 But until recently, marketers lacked the data and know-how to integrate this insight into the powerful market mix models that help drive about $200 billion in advertising expenditures in the US alone. But with TotalSocial data, brands now have a unique resource to help them understand and manage the full power of social influence. Want to see social influence data in action? Download our latest special report, "The Remarkable Influence of Millennial Men," which takes a deep dive into the influence this demographic group has over consumer purchase decisions.